When Priya of Cook like Priya asked me to do a guest post, I was so thrilled, because it is my first time. I instantly accepted. 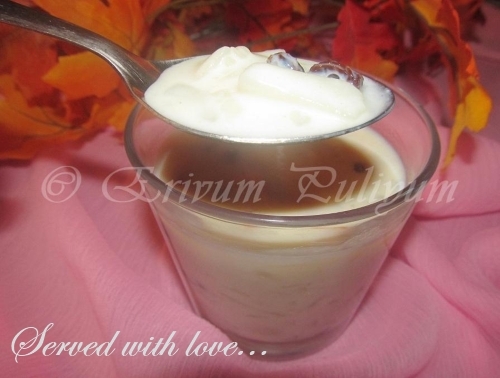 I admire her blog - the layout, design, pictures, the words she uses and also her recipes. If you haven't been to her space take a peep here. We both are in the baking group, so we got to know each other personally. She is a very bubbly cheerful person and am so happy to have her as a friend. 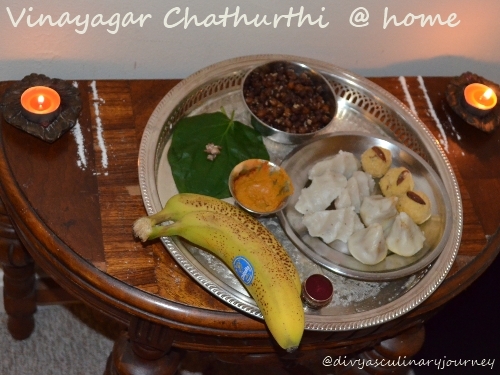 Initially I wanted to do some baked dish for the post, but later changed my mind thinking one after the other festive seasons are about to come , so Indian dessert would be most appropriate. 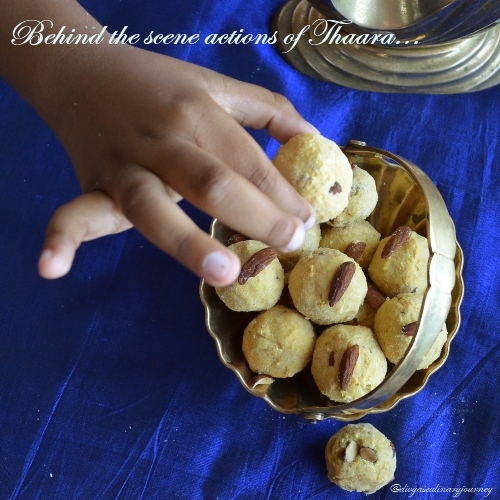 Also Thaara loves laddoos (any type) a lot, that is also another reason for selecting laddoo. Below there are some pictures of the laddoo. The first picture you can also find in Priya's place, meaning virtually am bringing in laddoo to Priya for the guest post and after clicking the picture, I was focusing to click some pictures , by that time, Thaara is trying to take laddoo from the basket, she couldn't resist it. I clicked the picture of it too. That is the other picture. 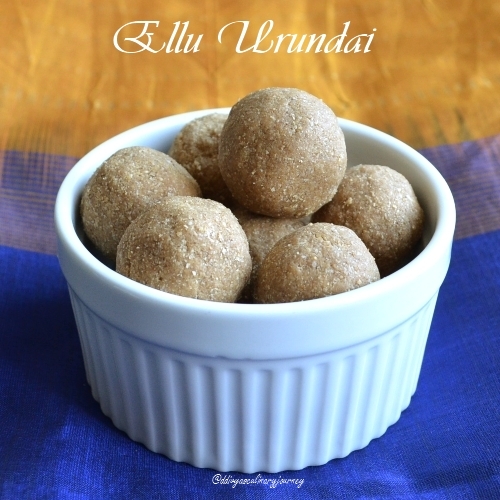 Anyway, the laddoo, was a hit at home, both Hubby and Thaara loved it. Most of it were gobbled by Thaara and rest by Hubby and few friends. 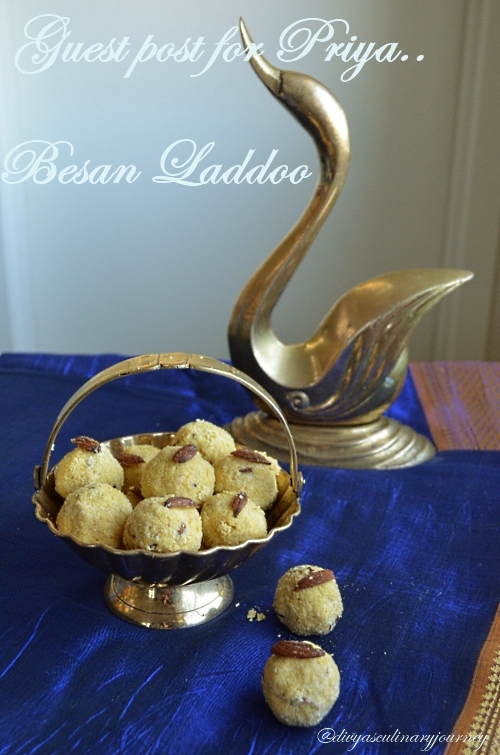 The laddoo almost melted in the mouth and the toasted, chopped almonds added crunch to the bite. It is a yummy laddoo. 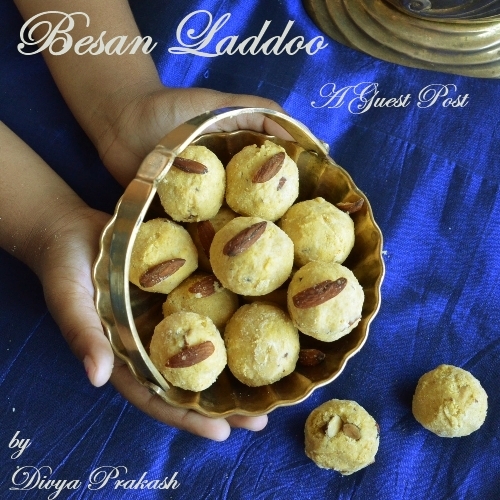 Now you can imagine the taste of the Laddoo.. For the recipe, hop on to Priya's space. Lord Ganesha is widely worshiped as God of,wisdom, prosperity, good fortune and health. Also before beginning anything new, he is the one worshiped first. He is believed to remove all the obstacles, destroy all evils and bring in success.It is his birthday today. 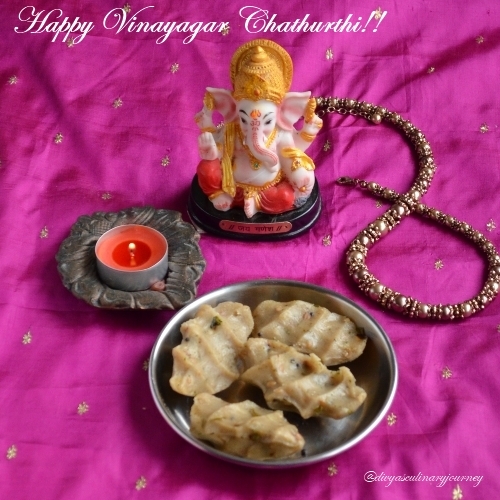 On this special occasion, wish you all a Happy Vinayagar Chathurthi!! 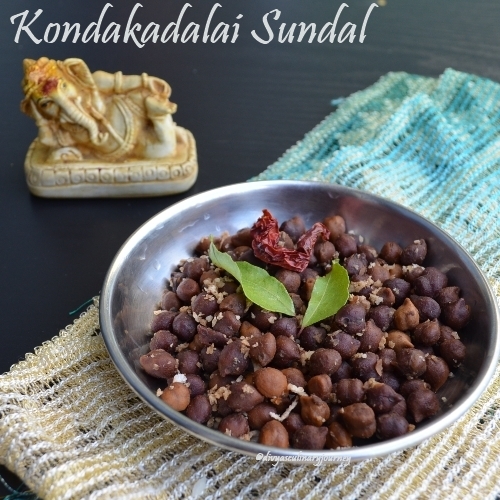 The most famous dish made on this day is kozhukattai. 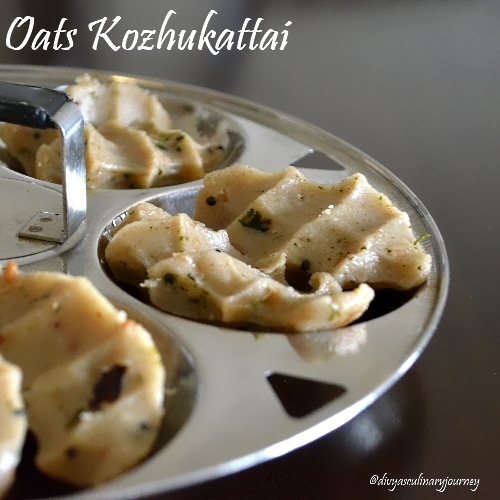 What can be more apt than Oats Kozhukattai for breakfast on this special day? Yes. 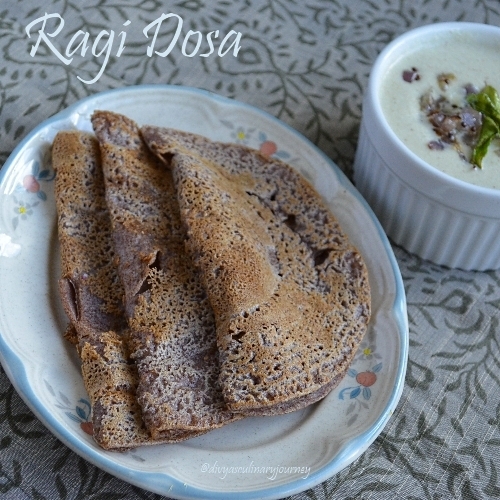 Today's recipe is Oats Kozhukattai. Dry roast the oats till it gives mild aroma. Then let it cool and powder it finely. 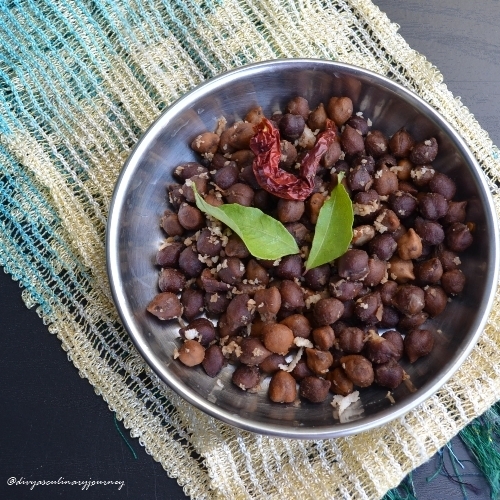 Heat oil in a skillet, add mustard seeds, urad dhal, red chilies and curry leaves and fry till urad dhal turns color lightly, then add chopped cilantro mix well and remove them from heat. Let it cool. 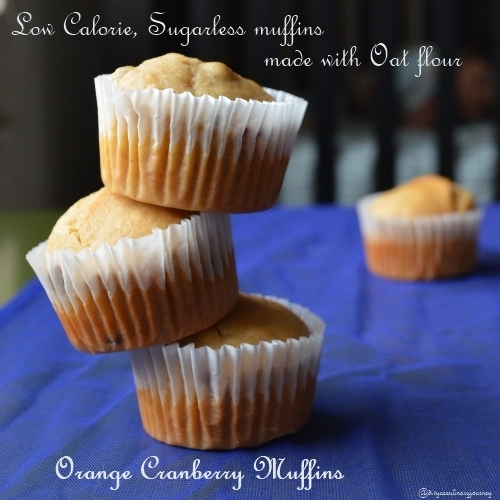 Combine oats flour, rice flour and salt. Then add the tempered mixture to the flour and required quantity of hot water and knead the flour till they are fully combined and a dough is formed(Chappathi dough like consistency). 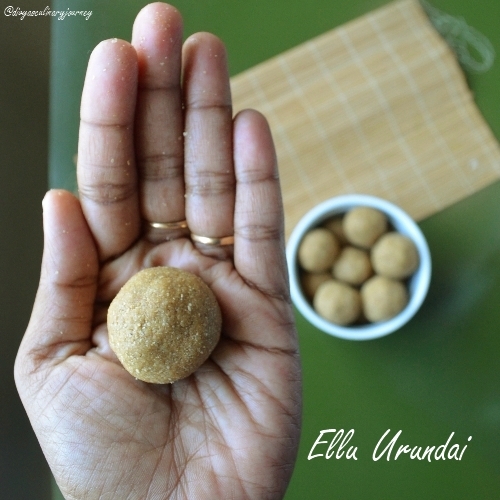 Take this mixture, roll into equal sized balls and take each ball in palm close the fingers and press to get the desired kozhukattai shape. Do the same to all the balls. 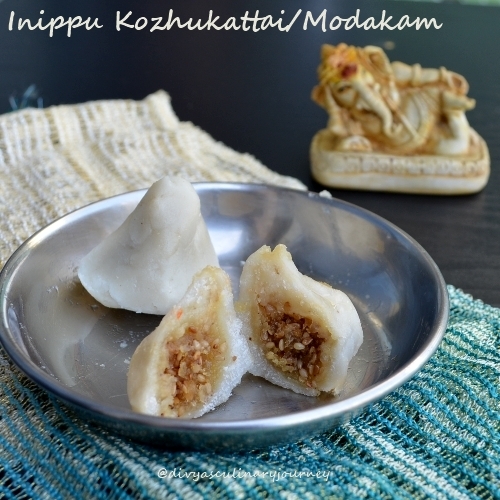 Then grease a idly plate and steam cook these kozhukattais for 7-8 minutes. Remove from heat, keep them covered till it is ready to be served. I got about 12 kozhukattais. For kneading, I used about 3/4 cup of hot water plus few more drops. Take care not to add too much water. While storing keep the kozhukattais covered, when kept open they get dried very fast. I love to bake. 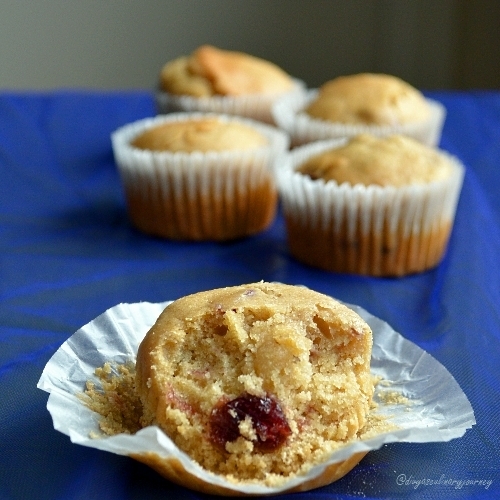 Though my love for baking started years ago, I began baking only after landing in the US. 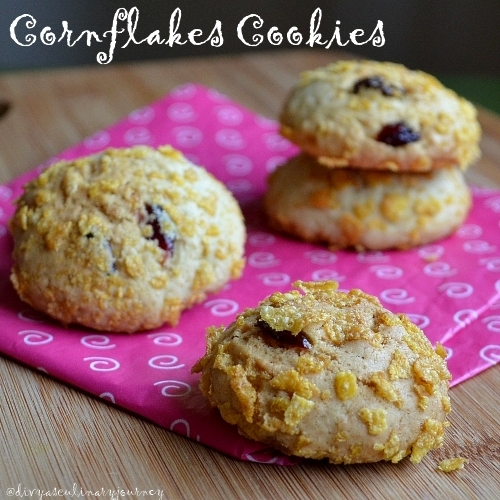 So I joined a baking group and theme for the month was cookies and I selected Corn flakes cookies from the book, Baking: Commonsense by Murdoch books. 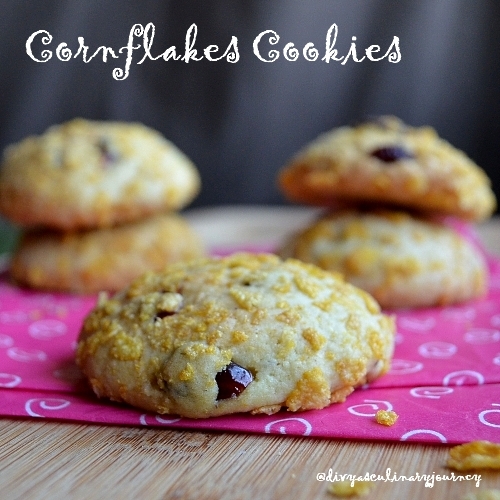 Corn flakes covering the cookies gives the crunch required on the outside and it is soft on the inside with a mild coconut flavor and loaded with raisins and cranberries. Yum!! I just halved the recipe and it yielded around 12 cookies(regular size) and 2 little cookies (I made for my son without the cornflakes) and also I added some extra cranberries along with the raisin except that I didn't change anything else much in the recipe. 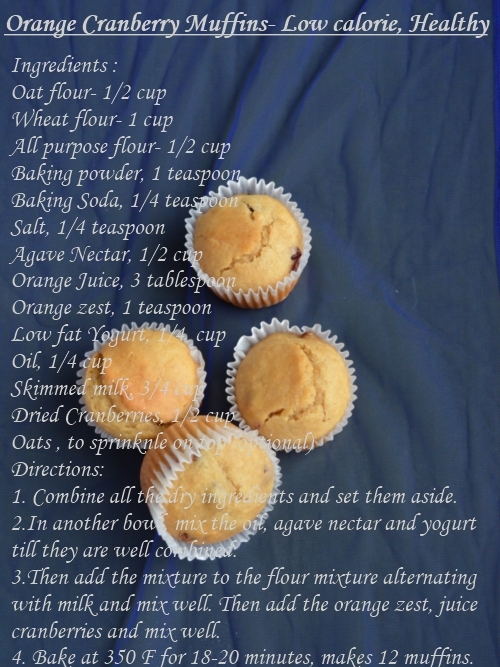 Sift together flour, baking soda and baking powder and set it aside. Cream together butter and sugar till they are fluffy and add a egg and beat them lightly and then add vanilla and mix them till they are well combined. Then add the flour mixture to this mixture and using the spatula mix them well, and now add the dessicated coconut, raisins and cranberries and mix them till they are fully incorporated and the dough is smooth. 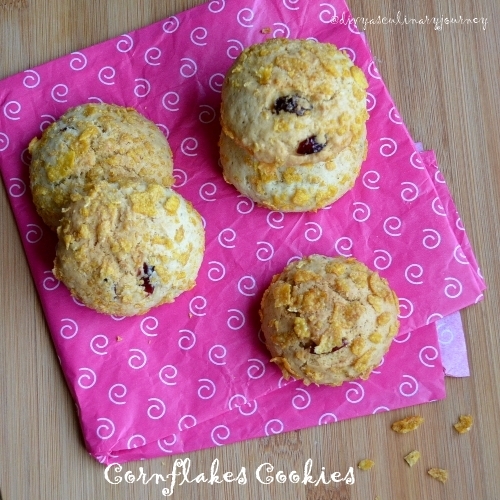 In a shallow dish take the crushed cornflakes and take a tablespoon of the cookie dough, drop and roll them in these cornflakes and arrange them in a cookie sheet. Once all the cookies are arranged, bake them in the oven for 12-15 minutes until they turn lightly golden. Let them cool completely then store them in airtight container. Eat and enjoy as desired. Being away from India, I really miss my Mom's cooking a lot. Special ingredient in her cooking will always be her love for us. 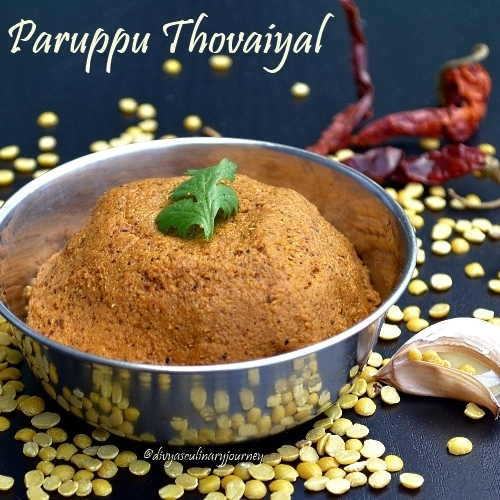 I love everything my mom cooks, especially her egg kuzhambu. Though I have tried the recipe so many times, still it does not match with hers. But sure, it is my hubby and little girl's favourite. 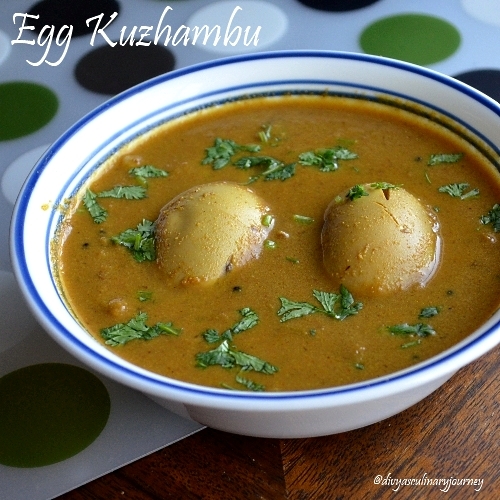 Just wanted to share my mom's Egg kulambu recipe here. 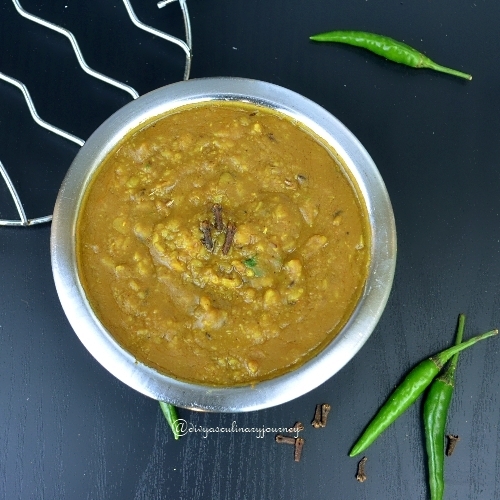 It is a tamarind based spicy and tangy gravy made with boiled egg. 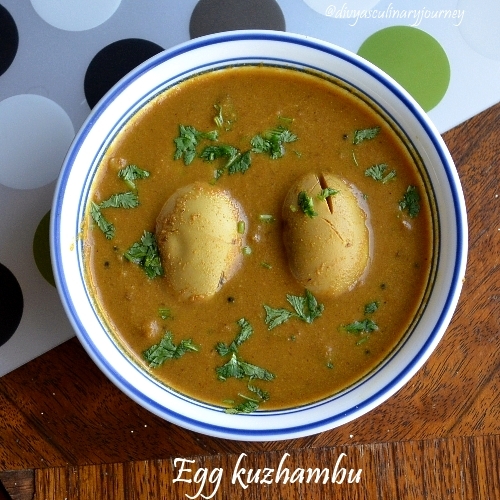 South Indian style spicy tangy tamarind based gravy with boiled egg. 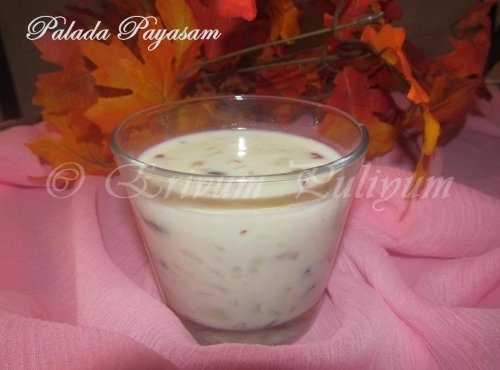 This gravy can be had with rice, idli or dosa. Soak Tamarind and extract it. In skillet add two tsp oil,add cumin seeds,then add chopped onions, saute till its golden brown.Then to it add turmeric, chilli and coriander powders. 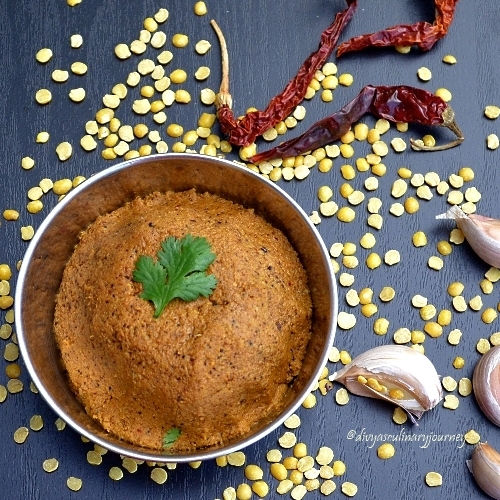 Finally add coconut and switch the stove off , when the roasted coconut gives a good aroma. Let it cool for a while and grind it to paste. 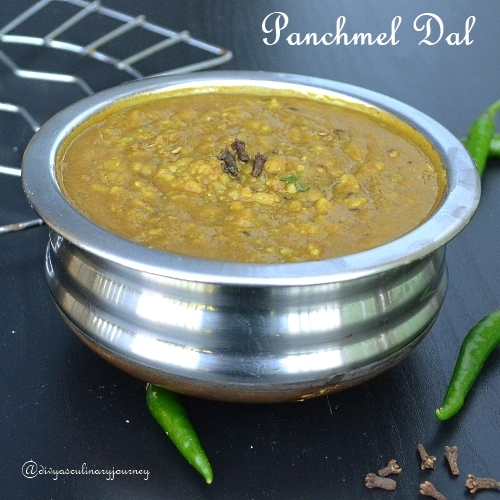 In a sauce pan, add remaining oil and then add mustard seeds and fenugreek seeds. Add asafoetida, curry leaves and garlic, cook till the garlic is a light brown colour. To it add the ground paste, and the tamarind extract. Let it cook for 3-4 minutes. Then add water and salt to taste. Finally, add boiled eggs. Let the gravy simmer till oil seperates. Finally garnish it with cilantro. 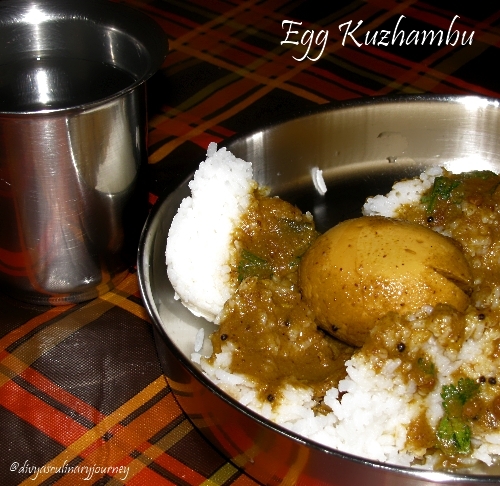 I made small slits in the egg, so that the flavour of the kuzhambu can get into it. 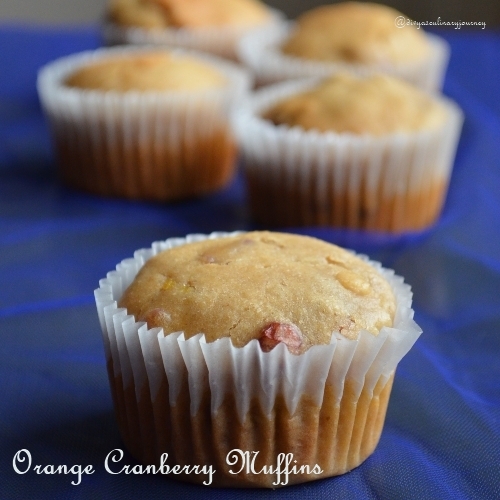 I feel like it has been ages since I last posted any recipe in this space. It started off as a small vacation break and one thing lead to another and couldn't get back into action. 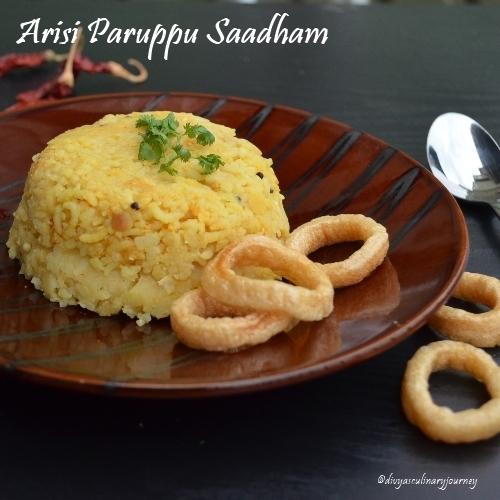 Finally here I am with a recipe- Arisi Paruppu saadham. It is a simple and easy one pot meal, which makes it great for packing lunch on a busy morning. 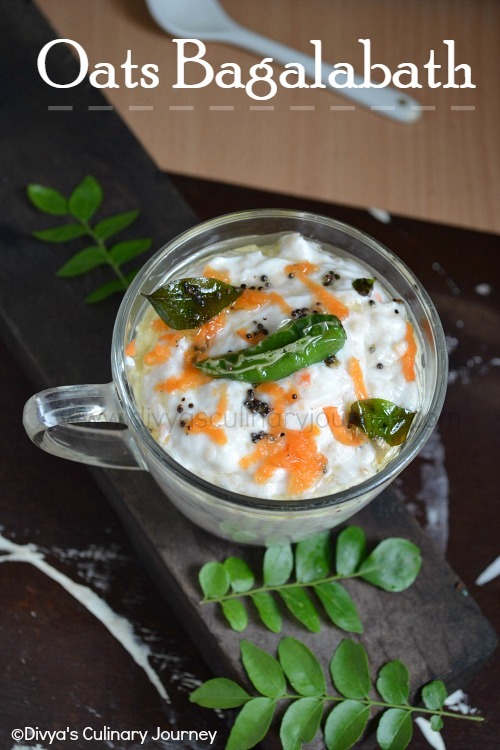 This dish is a special of Coimbatore and everyone have their own way of making this dish. 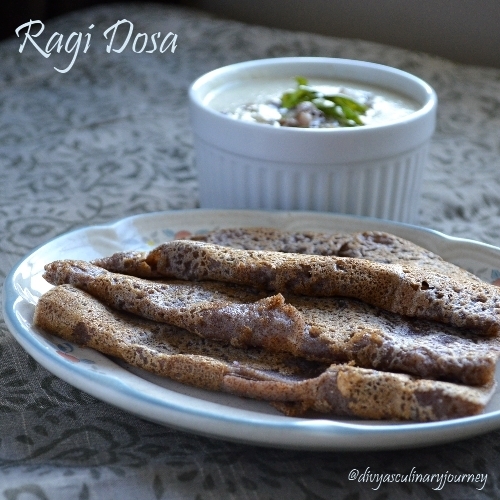 When I decided to blog about this dish, I mailed my Mom for her recipe and made it. I prepared it one busy day and in a hurry clicked some pictures and I served it with some fry-yums. Wash the rice and dhal and set them aside. Heat oil in a pressure cooker, add mustard seeds, cumin seeds, cloves, cinnamon and fry them for a minute or two. Then add the garlic and curry leaves and fry for another 2 -3 minutes until they garlic turns a light golden brown. 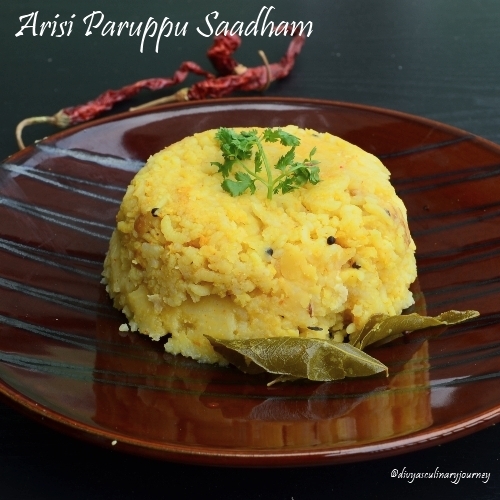 Then add chilli powder and turmeric powder,asafoetida then add the rice and dhal, add salt to taste and water (in the ratio 1:2.5) mix well and add a handful of grated coconut, close the lid and pressure cook. Once the cooker whistles, reduce the flame and let it cook for a 5-6 minutes in a low flame, turn of the heat. Once the pressure releases, add 2-3 tablespoons of ghee, mix well and serve. You can add tomatoes too. But I haven't used them. 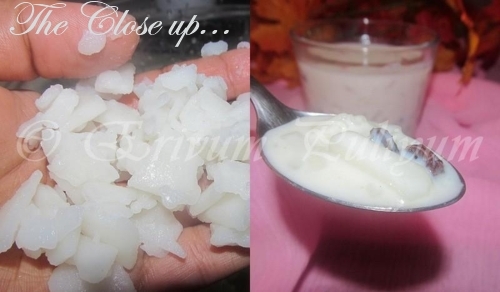 Instead of grated coconut, you can chop up the pieces of coconut and add to the rice. Mom used to do it. The rice will be mushy. If you want them to be less mushy adjust the proportion of water accordingly.